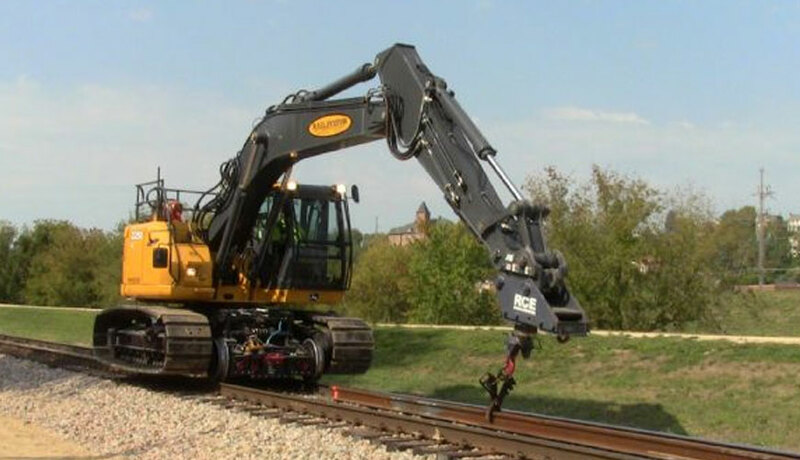 An innovative approach to tie tamping using little or no track time utilizing the proven reliability and latest technology that is provided in a John Deere excavator. 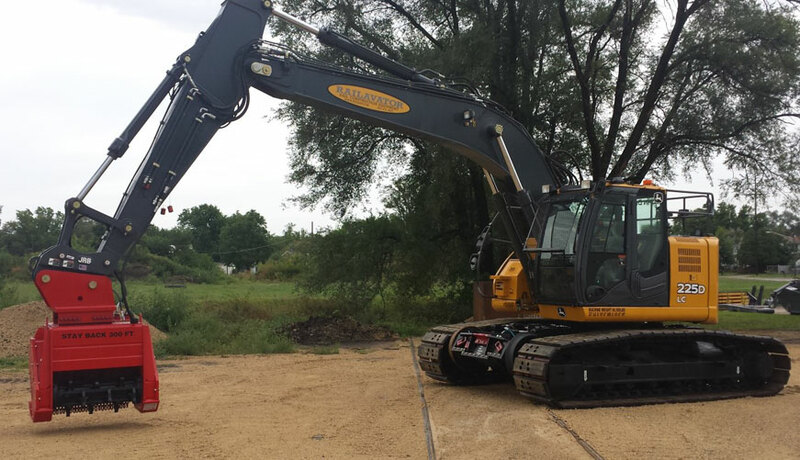 The excavator is equipped with a hydraulic package to meet the requirements of the Tamper attachment. Equipment can swing out of the way in high traffic areas to allow trains to pass without interruption.Spot maintenance where fouled ballast needs to be removed and new ballast tamped into position. RCE’s tamper heads manufactured in-house feature 360 degree rotation systems and are available in two or four motor configurations. RCE can provide an excavator mounted vibratory driver. The vibratory pile driver is an excavator-mounted attachment with an articulating side grip that speeds the pile driving process. 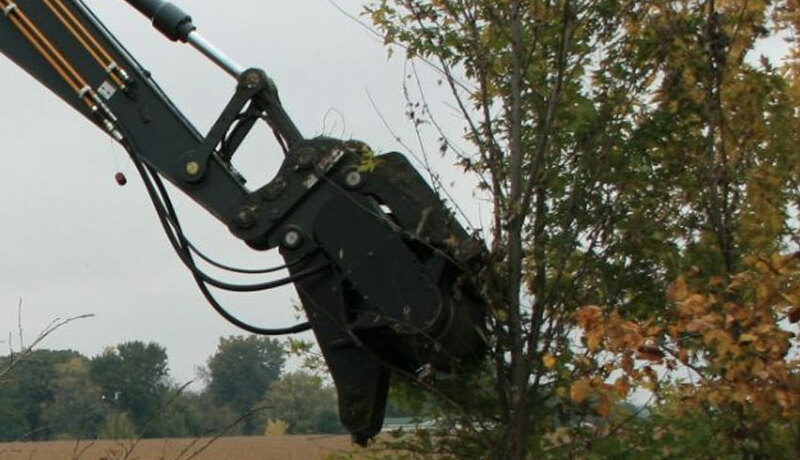 This attachment can be easily mounted to an excavator utilizing the existing hydraulic circuitry to safely and quickly pick up, unload, place, drive and extract piling. This effectively eliminates the need for peripheral equipment such as cranes, loaders and lulls accom-panying manpower. It uses a high-frequency of 3,000 cycles per minute coupled with the crowd force produced by the excavator to liquefy the soil and drive piles into virtu-ally any type of soil condition. Combining high frequency vibration and excavator crowd / retraction forces, the vibratory driver delivers impressive driving and extracting capabilities. This hydraulic attachment with tilt and rotation allows for easy placement and insertion of ties. 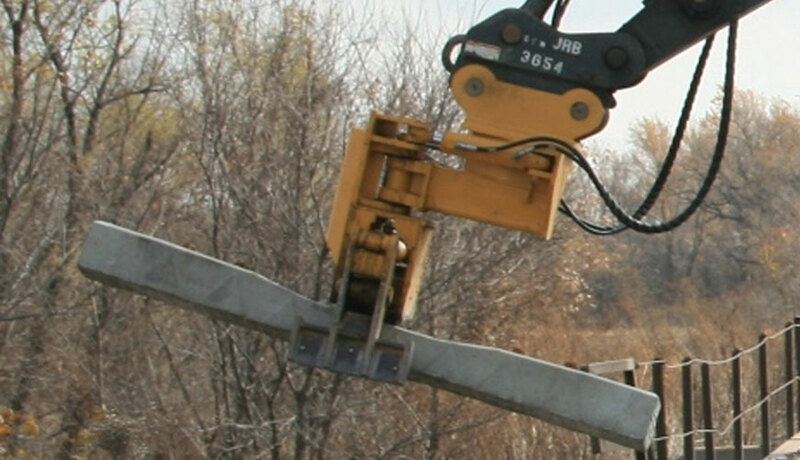 Attachment connects with a JRB coupler and fits to several excavator models. Manufactured in house, RCE’s tie head has 360 degree rotation. Various sizes available depending on carrier size. 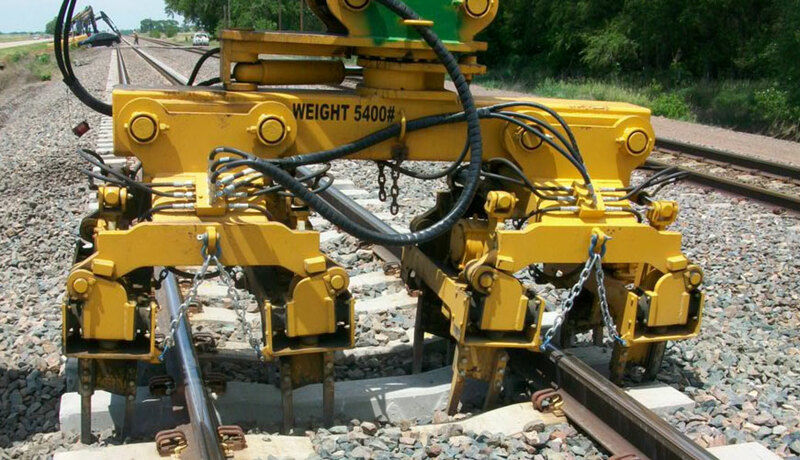 RCE has developed a modern approach to railroad ballast under cutting, which pro-vides the ability to clean the mud from within the track without long setup times. The hydraulic-powered under cutter head with tilt, pitch and rotation for clean-out can cut rates up to 7 feet per minute depending on track conditions. RCE now has more under cutter bar sizes available to enhance the use of the excavator under cutting process. RCE can now supply the 75G, 85G, 135G, 245G, 250G and 350G excavators with under cutter bars ranging from 9 feet to 15 feet in size. By increasing these options, RCE customers can perform under cutting with all the RCE models of hign rail or standard excavators. 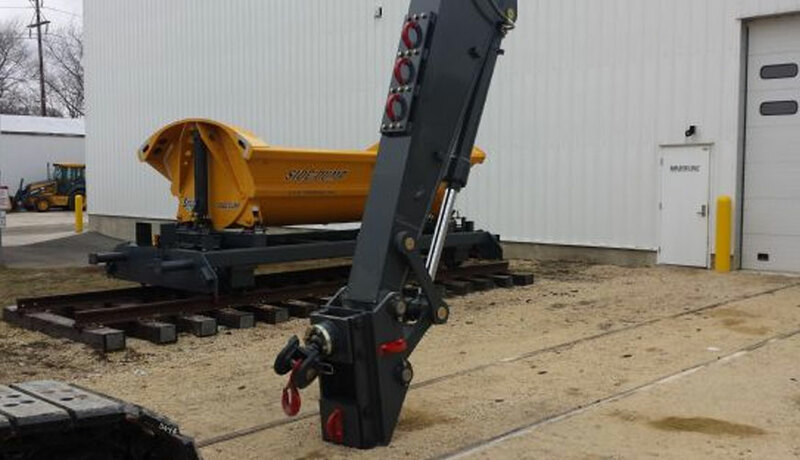 The larger machines will have more hydraulic power to perform more efficiently in hard conditions, and the longer bar will be beneficial for switch under cutting. The under cutters feature carbide cutter tips for durability and an optional hydraulic integrated 360 degree rotation system. The must-have tool for right-of-way clearing and site preparation! 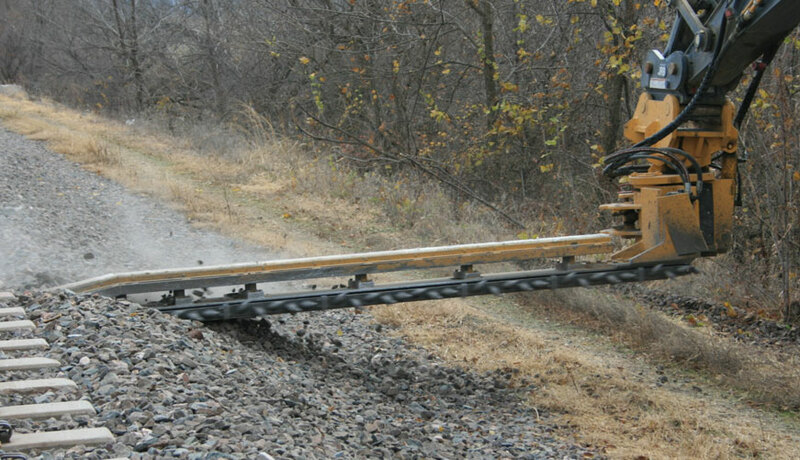 RCE's Brush Cutter is read to chop, even in the roughest of terrain. Maximizing power and convenience, the prime unit of a Railavator is combined with a heavy duty, front mounted shredder cutting head off the excavator arm. 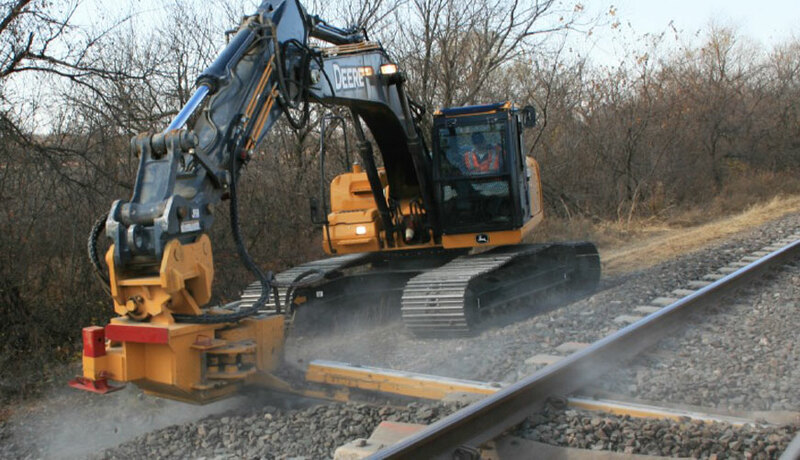 Offering multiple options, RCE's Brush Cutters can be customized by excavator model (high rail and conventional) and size of tree grinding and brush clearing heads. The available mowing heads make a clear cut without the hazards of flying debris. RCE has both a 42” tree grinding head and a 96” brush cleaning head available. A separate Deere engine and hydraulic system power the brush cutting head. 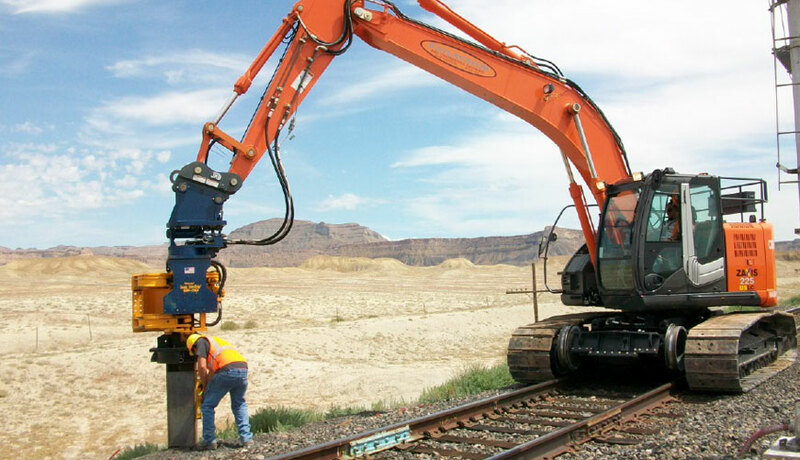 Attach-ments can be utilized on both, on– and off-track excavators. 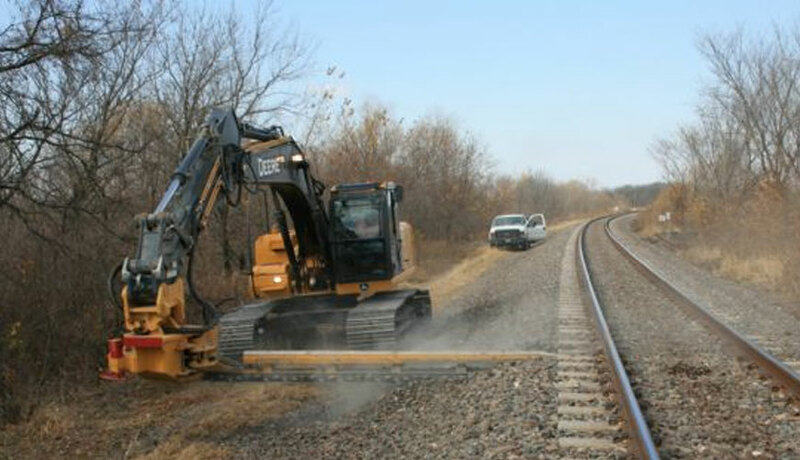 The laying of railway track, either in the initial construction of a railway line or when replacing existing rails, is difficult, time consuming and labor intensive. 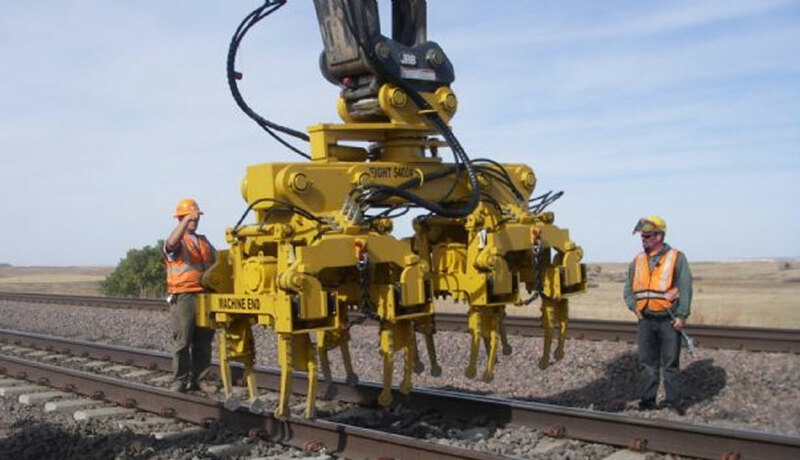 The RCE’s rail threader supports and guides the rails on a rail bed, securely and accurately positioning the rail for work. The Rail Threader attachment for the 245G and 250G Railavators.